Teen Driver Killed in Crash in Yacolt; Icy Roads to Blame? A 17-year-old boy was killed in a single-vehicle crash Monday morning in Yacolt, according to the Clark County Sheriff’s Office. Emergency crews responded to the 3400 block of Northeast Kelly Road, about a quarter-mile from Gabriel Road, around 9 a.m. The boy was a student at Battle Ground High School. His Dodge pickup truck crossed the center line, hit a tree and flipped upside down. He was the only person in the truck. Investigators said he was not wearing a seat belt. A witness told investigators the pickup was “fishtailing” on icy roads before the crash. According to multiple police and fire officials involved in Monday’s fatal crash, icy roads were likely a contributing factor. Clark County Fire District 10 chief Sam Arola said there was a lot of black ice in the area at the time of the crash. Clark County Sheriff’s Sgt. Alex Schoening told KPTV that the crash a tragic reminder of just how quickly weather-related events can cause disaster. “North of Brush Prairie, a lot of those roads stayed wet,” Schoening said. “We had fairly heavy fog last night, so there’s a lot of moisture still in the air and the temperature dropped, and those roads became a sheet of ice. “We just ask that drivers be extra cautious, give themselves a lot more time, a lot more room, a lot more gradual slowing when braking. Where you think you’re on a wet roadway – all of a sudden, you’re sliding sideways – it can happen very, very quickly – and it’s all about preparation. FOX 12 in Oregon contacted the Clark County Public Works Department. 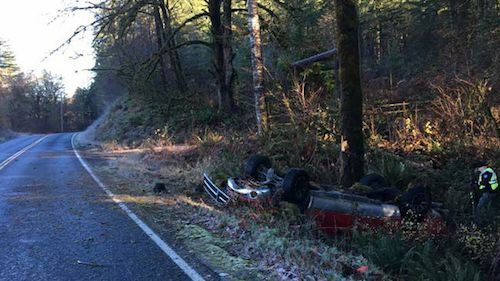 A spokesman with the department declined to say whether the road the crash occurred on had recently been sprayed with deicer, citing the ongoing investigation. If you or a loved one has been involved in a teen driver accident, contact Davis Law Group today for help. Call (206) 727-4000, use the chat feature below or fill out the form on the contact page to get started. Award-winning accident attorney Chris Davis has written a series of FREE books, including one for parents of teenage drivers in Washington state. These books answer common legal questions that people and their loved ones may have about their legal rights, including how to handle your claim on your own and when you might need an attorney's help. Get your complimentary copy of "Teen Drivers & The Law: What Every Parent In Washington State Needs To Know About Parental Legal & Financial Liability for Auto Collisions Caused By Teen Drivers" by clicking the Order Now button below.